Researchers at Rutgers University have developed a robotic blood taking device. It's designed to insert intravenous needles to draw blood and then analyze the samples. At present there are about 2 billion blood tests per year in the US alone. The tests are performed by individual practitioners and for the most part sent to a centralized lab for analysis. There the samples undergo lab-intensive analysis. It's a multi-billion dollar endeavor of medical importance but also a contributor to rising medical costs. With the Rutgers robotic device, ultrasound imaging locates the blood vessel. 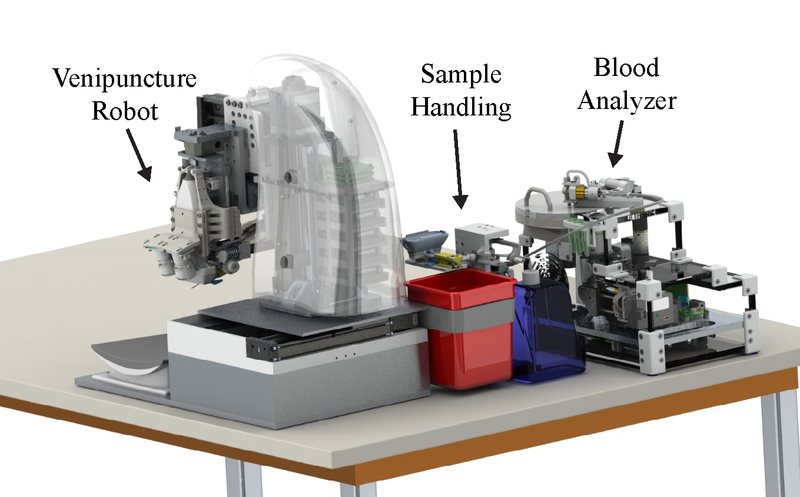 Then miniature robots place the needle in the targeted vessel, draw the blood, and finally analyze the sample. 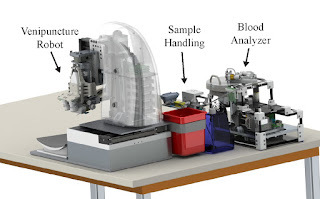 With blood tests influencing 80% of medical decisions, robotic testing could considerably cut turnaround times. Importantly, the robotic blood tests represent one-stop medical testing and eliminate the chance of human error. The robot blood-tester has been successfully tested on artificial limbs. Soon there will be a human feasibility study. When the robots are cleared for human patient duty, the resulting benefit is blood testing and analysis at the point of care and with considerably less expense. Another important role for robots globally.